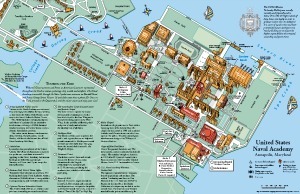 Please read FAQs for Security and Access to USNA prior to your visit. Access to the Academy grounds is limited. Anyone with a locally prepared USNA ID Card or a DOD credential, including military retirees and dependents may drive onto USNA. All others will need to park outside the Academy and walk in through Gate 1. All visitors 21 years of age or older must have a valid picture ID (see the list of Acceptable Forms of ID). Visitors under the age of 21 who do not have a valid picture ID must be escorted by an adult with a valid form of identification. Please check the current security restrictions before planning a visit. Take US Route 50 East for 35 miles and get off on Rowe Blvd., Exit 24. Take Rowe Blvd. 1.6 miles to where it dead-ends at College Ave. - make a left turn. Go to the first stop light, this will be King George St. - make a right turn. Follow King George St. for two blocks and you will see Gate 1. Take either Interstate 97 South or Maryland Route 2 South for 26 miles and get off on Rowe Blvd., Exit 24.